This is probably the easiest tool to use – but that many people don’t have. 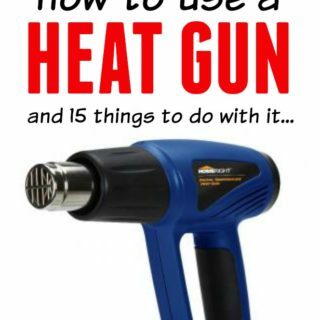 I didn’t have a heat gun until last year – and I didn’t get it out of the box for a month or so after I got it because I wasn’t quite sure what to do with it. Let me tell you – it can do so many things. At my old house, killing snakes was at least a monthly occurrence. It was wrapped around a porch chair, hissing. I killed it with a hoe. And there was the one that liked to live inside my roof on the back of the house. Every once in a while, it would stick its head out and I could see it from the kitchen window – I could never catch him. And then once, as I was walking down the stairs, talking to my cousin on the phone, I was met by a snake in the middle of the living room floor. I hung up, killed the snake, then called her back two minutes later. She answered asking if I was ok. Of course, it was just a snake. It was a nearly 100 year old farm house with lots of holes – what did you expect? Luckily, we don’t really have any snakes to deal with around here. 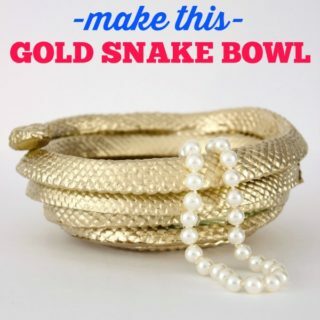 Except pretty gold ones – made into a bowl.